This is one of the most scenic hikes in the Cuyahoga Valley. It’s rocky and rough, so make sure you’ve got sufficient footgear. There are striking, canopied hemlock trails to moss-covered rock formations, ferns, Ice Box Cave, and more at the Ledges. The payoff to the hike—good for more advanced hikers and those testing out new shoes, packs, and gear—is the amazing cliff ledge overlook and massive rock staircase. Or you can access the overlook from the parking lot for an easier reward. Steep in spots, this is a hike that makes you think you’re not in Ohio anymore; perhaps somewhere else in the world entirely, surely not the Cleveland-Akron area. Take I-77 to 271-N and exit on Route 303. Head east on Route 303 until you arrive in Peninsula. Turn right on Akron-Peninsula Rd. and take to Truxell Rd. Left on Truxell Rd. and continue until you arrive at parking (right side of the road). Entrance to the park locations is free; fees for special programs, rentals and additional accesses may be required. The Ledges Loop Trail is a moderate excursion through sandstone cliffs, known as Ritchie Ledges, but there are plenty of places on this hike where confident footing will come in handy. There are some very cool petroglyphs that date back to the 1900s along this hike, though it’s not known who carved them. Note that Ice Box Cave is closed to all visitors to prevent the spread of White Nose Syndrome, which is dangerous for local bats. Please respect all closures for the safety of CVNP’s wildlife. 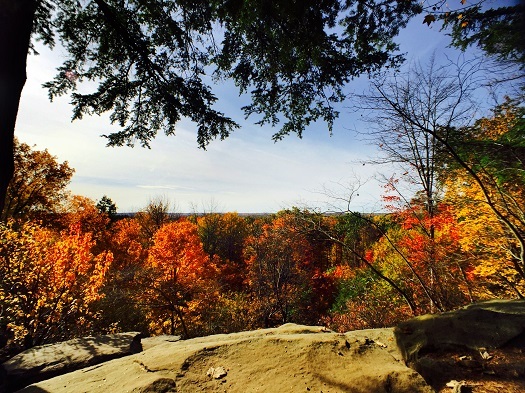 Whether or not you plan on exploring the deep caves during your visit, you can count on one of the best views of autumn from the cliffs and the best CVNP sunset, period. Note: the trail and cliffs are open year-round, but winter hiking should come with a bit of caution because the formations can be slippery. But even then, if timed right, this is one of the best views of the Cuyahoga Valley. If you want to add some hiking time to trip, check the sidebar for nearby trails. Top to bottom, this whole suite within the CVNP is a stunner. So much so, that some heartier hikers will feel compelled to forego Brandywine Falls for this trail—and would be well within rights to do so. Kids and geology enthusiasts are especially drawn to the Sharon Conglomerate of alcoves, crevices, formations, and outcroppings that are estimated to be millions of years old. But when it comes to making this trek, parents may have trouble keeping up with those nimble kiddos along the rockier parts, and those with knee and hip problems might wish for a hike with lesser stress or strain.